SampleStorm: Get a free sample of Zing Stevia sweetener! 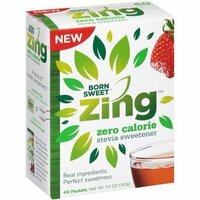 Get your free sample of Born Sweet Zing Organic Stevia Sweetener - Zero Calorie. Fill out the form on the next page to request a sample pack, along with a coupon. Try the delicious, clean sweet taste of zero-calorie Born Sweet Zing Organic Stevia Sweetener in coffee, tea and other favorite beverages.